Chia seeds are rich in Omega-3 fatty acids (ALA: alpha-linolenic acid), and have become quite popular for making healthy snacks and drinks. I hesitate to jump on the “health food” bandwagon… many of the so called “superfoods” and things of that nature ARE good for you… but not necessarily any better than other more common healthy foods. But variety is nice, and we all get bored eating the same thing over and over (Well, at least I do! )… so I figured that I would give it a try. Eaten raw, chia seeds provide a crunch similar to a sesame seed. 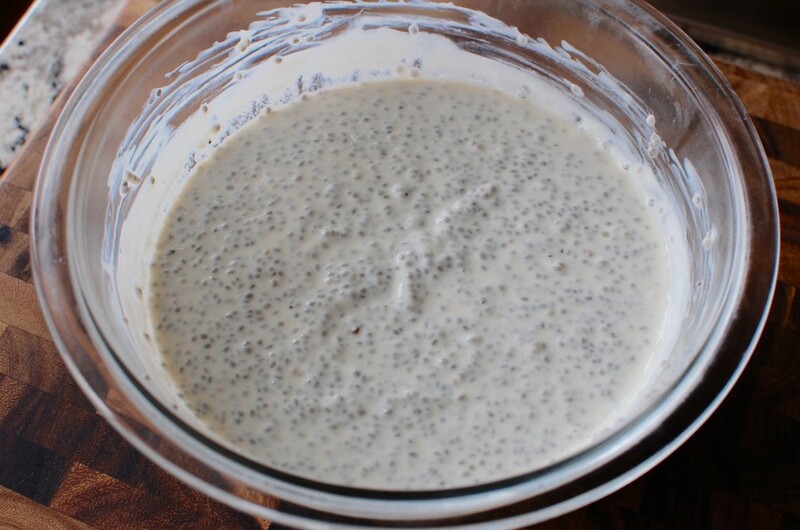 However, when soaked in liquid for a period of time, the outer portion of the Chia Seed swells into a gelatinous coating – similar to tapioca. 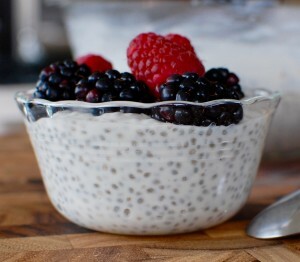 Giada de Laurentiis has a “Chia Seed Pudding” recipe that had really good reviews, so I thought I would give it a try. Her recipe calls for unsweetened almond milk and plain (low fat) Greek yogurt… I did substitute for these items because: #1. I’m not a huge almond milk fan, and #2. If I’m going to eat yogurt, full fat yogurt tastes the best – I can’t stand low fat or non-fat yogurt. Instead of almond milk, I used Silk brand Vanilla flavored coconut milk (It comes in a carton at the regular grocery store). 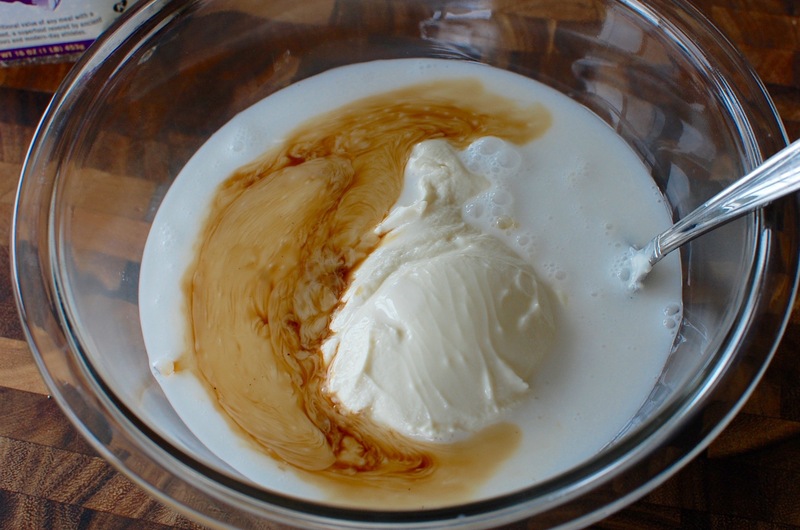 Instead of low fat plain yogurt, I used Greek Gods brand Honey-Vanilla Greek Yogurt. (See the picture below right for the brands I used.) The resulting pudding had a texture similar (but not identical) to tapioca, with enough sweetness and flavor to make it taste like a treat. Serve it topped with fresh berries, or your choice of toppings like granola, nuts, or other cut fruit. One recipe makes enough for two breakfast/meal sized portions at about 335 calories per serving, or four snack sized portions at about 167 calories per serving – not bad! 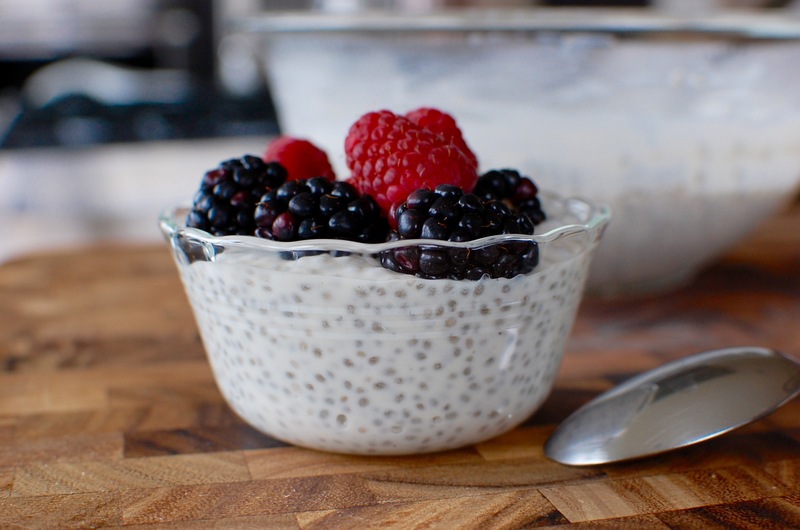 Chia seeds can usually be found in the baking aisle of the supermarket, or at health food stores. Toppings: fresh berries, fruit, granola, chopped nuts, etc. 1. 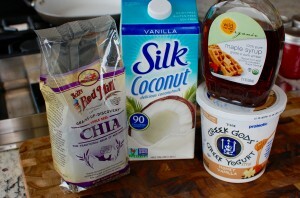 Mix the coconut milk, greek yogurt, salt, maple syrup, and vanilla extract in a small bowl. 2. 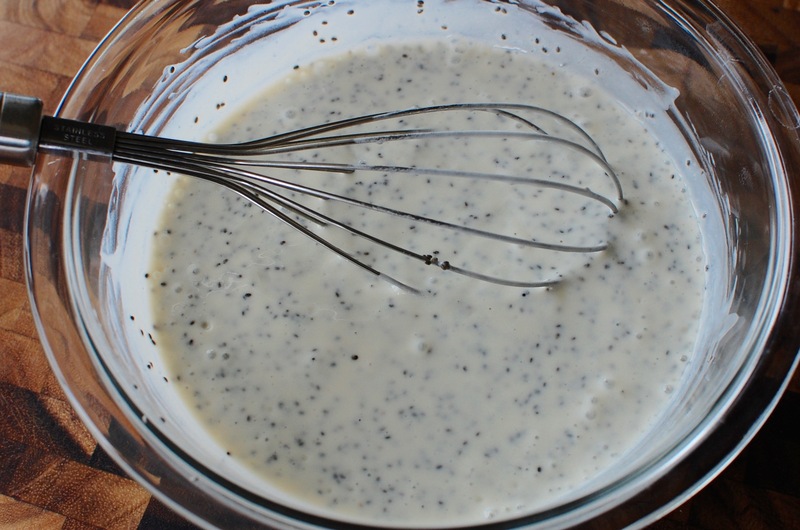 Whisk the mixture thoroughly until smooth. 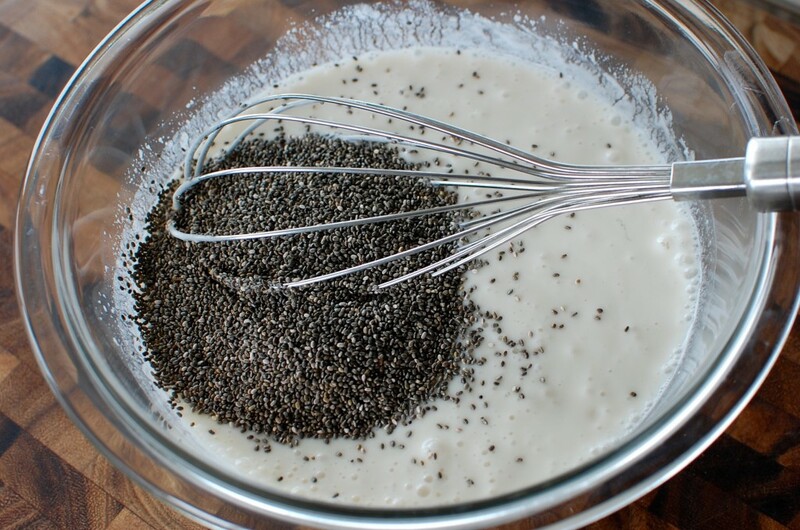 Add the chia seeds. 3. Whisk until evenly distributed. Cover and let sit at room temperature for about 30 minutes. 5. Mix again, then spoon into serving dishes and top with fresh berries, cut fruit, or chopped nuts. Enjoy! This recipe makes 2 meal sized servings (335 calories per serving), or about 4 snack sized servings (167 calories per serving).